Hello, friends!! 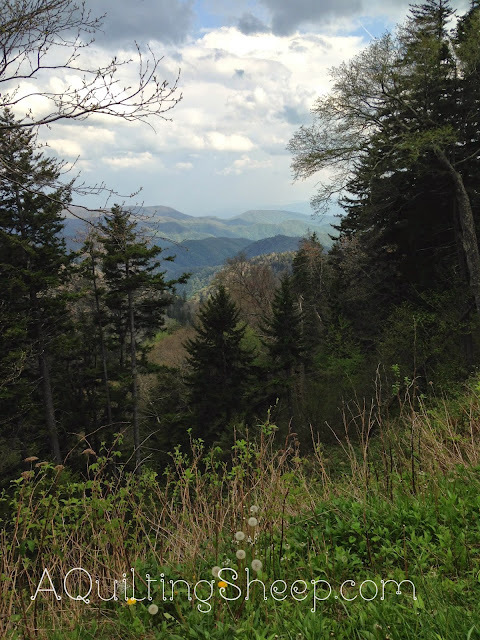 Last week, my hubby and I spent many wonderful hours in the great Smoky Mountains between TN and NC. It was so good to get away and to relax. The views were breathtaking...Photographs simply can't do them justice. 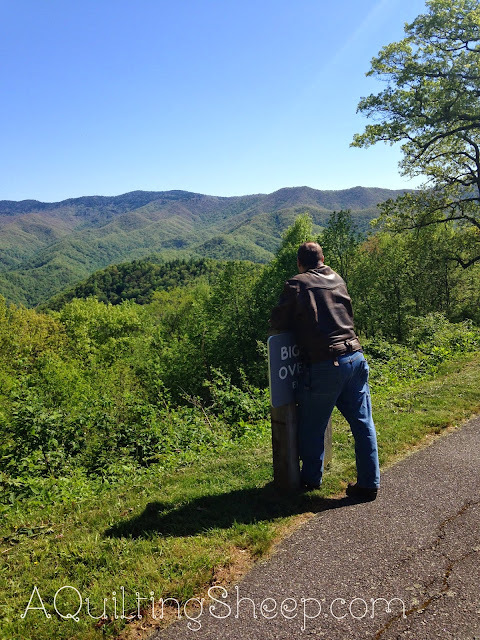 We rented a Harley trike for a couple of days and took the Blue Ridge Parkway into Asheville, NC up and over Mount Pisgah. Now, I am a wee bit afraid of heights, but normally I am fine when my feet are on the ground. However, this road trip was an exception. The higher and higher into the mountains we went, the more nervous I became. At one point, we stopped at an over look and Russ pointed at the road up the mountain and said, "Wow! Look how much farther we have to go!" That was IT! I started to cry. My nerves got the best of me. We did finish the ride, but it was a challenge and Russ found a different way to come back to Pigeon Forge, TN. Bless his heart!! My hubby gets recharged when he is out in nature. 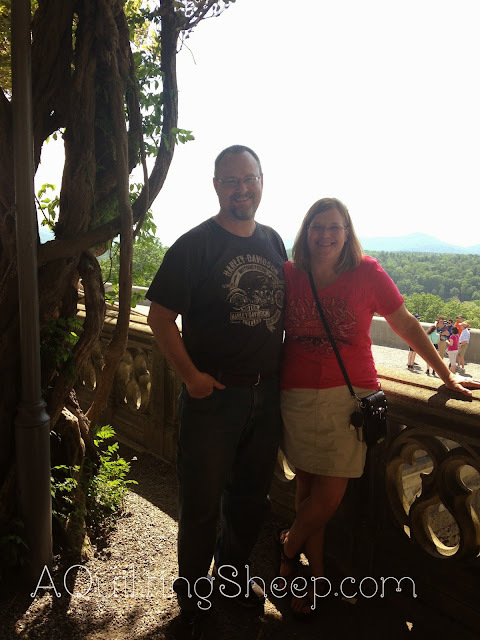 I would have to say, seeing Biltmore Estates in Asheville, NC and getting to spend the day with my blogging friend, Karen and her hubby was THE highlight of our vacation. Spending the day with beautiful people and seeing such a beautiful place was perfection...The Biltmore Estate had the Downton Abby clothing on display. No pictures are allowed to be taken inside the house, so to get a sneak peek, you need to go to the Biltmore Estates web page. We paid for the regular tour, but now that we know what an amazing place this is, we would love to go back and happily pay to go on their extended tours to learn more about the people who lived on the estate and more of the history. Oh, and be sure to try their wine!! It was truly a perfect day!! Of course, we found a few quilt shops to visit on our trip. =) The shops I most enjoyed most were Among Friends Quilt Shop in Louisville, KY, Asheville Cotton Co in Asheville, NC, Quilters Quarters in Waynesville, NC and Hancock's Of Paducah in Paducah, KY. We went to more, but those were the shops that enticed me enough to part with my dollars. =) Also, I want to make a special note that one of the gals at Asheville Cotton Co was especially kind. After taking the trip over the mountain, I must have still looked a bit pale. She asked if I was all right and I teared all up again and told her I was frightened by going over the pass and needed some pretty fabric to help me feel better. She confessed that when she was in a storm while visiting Iowa, she got so scared she cried. I wanted to hug her! Okay, on to the fabric! 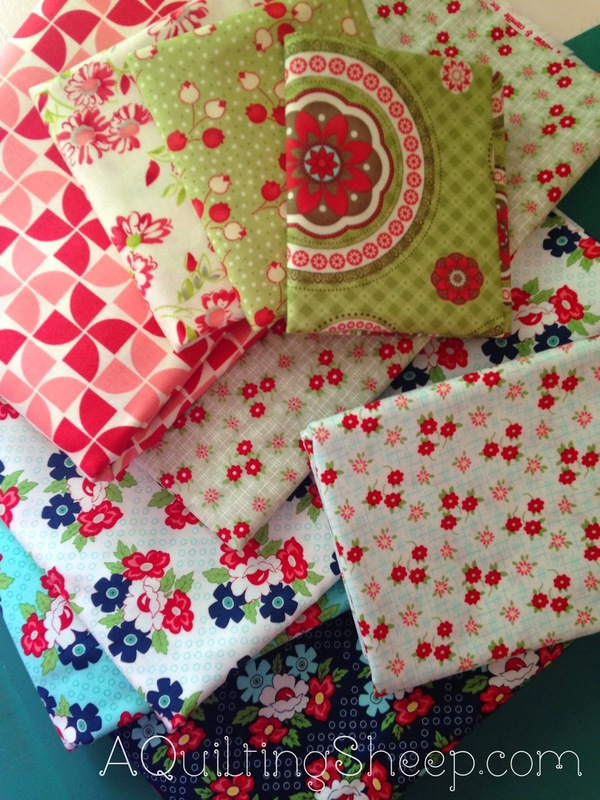 I always have my eye out for Bonnie and Camille fabric, especially their older lines. I found a few and also added some Daysail to my stash. These fabrics are going to get added to the fabric pull I have for the Vintage Farm Girl quilts I will be making. That is truly a fantastic book!! I wish more shops carried Lori Holt fabrics. I found the top three on the right, but that was it. 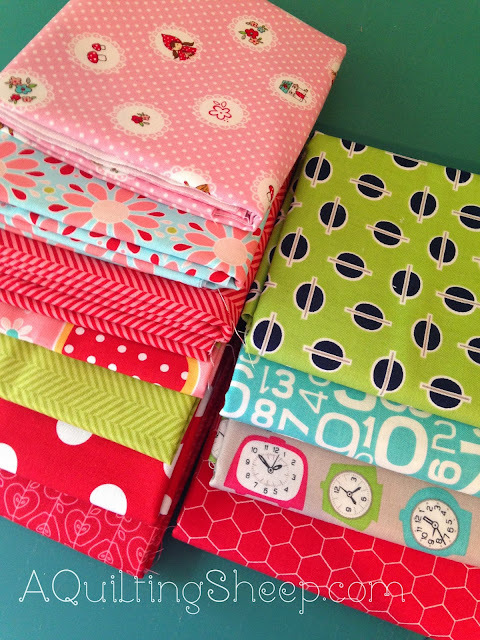 The shop where I work, Cotton Creek Mill, is going to carry at least 9 bolts of Lori Holt's new fabric line, Modern Minis, so if you are looking for Lori Holt fabric, too, and have trouble finding it in shops, keep us in mind. The release date is sometime in June. Personally, I can't wait! Does anyone else need a day to recover from a vacation? I took a three hour nap this afternoon. I hope I sleep tonight! Have a happy rest of the weekend!!! I went to college in that area and it is beautiful. That being said, I can't believe how many sleep deprived relatively new drivers were careening around those mountains. Can you email me your address? Something in your post confirmed something that I thought. that mountain pass is quite a trip! I would have cried over seeing a bear though I think. Oh your post made me homesick for TN. I just recently moved from there to NC. We lived only a short 1.5 hr drive from Asheville. I must admit my area in NC has a very nice quilt shop that helps with my homesickness 😉. I love you fabric purchases! I enjoyed your blog this morning. You were in my neck of the woods - I live in Jefferson County, Tennessee! My youngest daughter and I just returned from Biltmore Estates on Tuesday. We did the extended tours - first time! Loved it! I appreciate you naming the quilt shops you loved, I will make a day trip out of finding them and tell them I heard about them from reading your blog! Come back soon - maybe in a car next trip (wink, wink)! Awe I am sorry that the road was so frightening. I grew up in the mountains so I am part goat, but my step dad was always terrified of heights. Going to The Grand Canyon when I was a kid, we were lucky to get within 500 feet of the rim. Gorgeous fabric acquisitions. Your pictures are gorgeous, sounds like you had a wonderful time. When my kids were little we always went to the mountains for vacations. I love the beauty of the smoky mountains. Fall has the best colors, but I love it anytime. Thanks for the little tour. Oh Amy I'm so sorry you were frighten. I understand though. I loved our trip to TN when Darren and I went. The year before we went to Biltmore. I did enjoy the ride up on the motorcycle no so much down but up was good. Love the fabric finds you have. I started my Vintage Farm Girl too. Amy, I'm so sorry you had to have such a fright on your vacation! (((AMY)))! Back in 2006 we went to Arizona. We rented a minivan since we had two other people with us. I don't remember the name of the road, but it was KNOWN for having some ridiculously large number of turns in a very short road span. They even had T-Shirts saying that you had survived the road. I was a total BASKET CASE all the way down! My husband road the brake all the way and I was petrified the brakes would give out. If it had been our own car I would have known the brakes were in good shape...but a rental?? And to make matters worse we were stopped for quite some time as the road was down to one lane due to a fatal accident. The poor soul was still on the road, covered with a tarp. Because of the narrow, winding road it made bringing in equipment difficult. That was the last straw! When we finally got back on level ground I let my husband have it! He said he had no idea I would be that uncomfortable. Now he knows!!! Loved seeing your holiday pics. Good thing the bear stayed where he was :)! 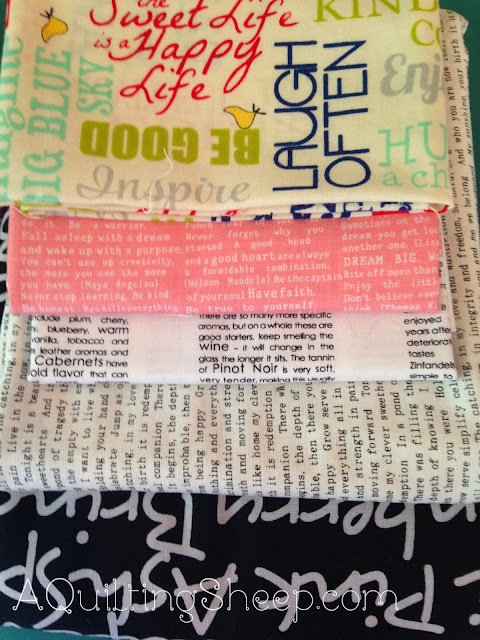 Beautiful fabric finds! Enjoy! 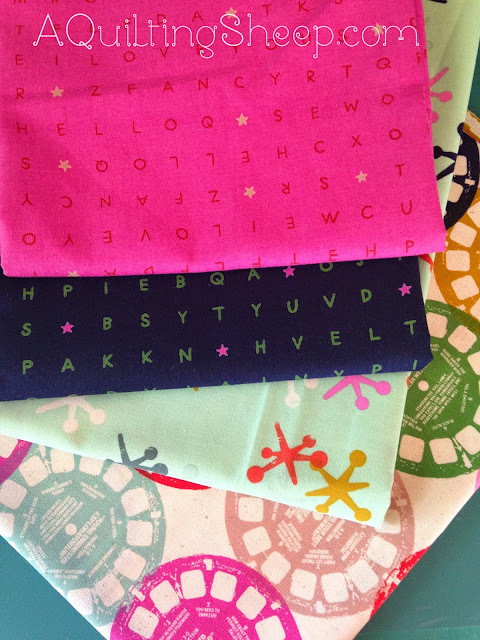 I see that you found some of the Apple of My Eye fabric that I used for my "Dancing Plus" blocks! I love the prints in it! Thanks for sharing the scenery you traveled through - I'd love to ride through that stretch some day! Amy I am so sorry you got scared on vacation. I just do not look down. Sounds like y'all had an awesome time though. It is always nice to get away and enjoy some nature. Oh my gosh you brought home some yummy fabrics. Love all the fabrics you brought home. Biltmore is fantastic! I took a roadtrip through that area with my best friend in the mid-2000's and that was definitely a highlight. I bought the book for my mom --- it's a cool keepsake. Super nifty history! My husband and I visited the Biltmore Estates a few years ago. It was amazing. The mountains are beautiful, but they can cause some anxious moments, too. Glad you had a wonderful vacation. I LOVE the Smokies - the first time I drove the Blue Ridge Parkway, it was night, there was a heavy fog, and the road had just been re-done and there were no lines on it yet. I drove over the same spot the next morning and was HORRIFIED, lol. I'm ok with heights, but the speed I was going in a heavy fog without any idea of what was right next to me was incredibly scary!! I'm glad you had a good trip, and that you got such wonderful fabric therapy after your fright! That is a beautiful part of the country. Our son and his family lived in Knoxville for 2 years and we saw a little bit of the area while they were there. They are now moving to the Atlanta area. Quilt shops are a must on any trip and it looks like you found some great fabrics. Sounds like such a great trip. I LOVED Biltmore, we took my mom there for her 50th birthday several years ago. 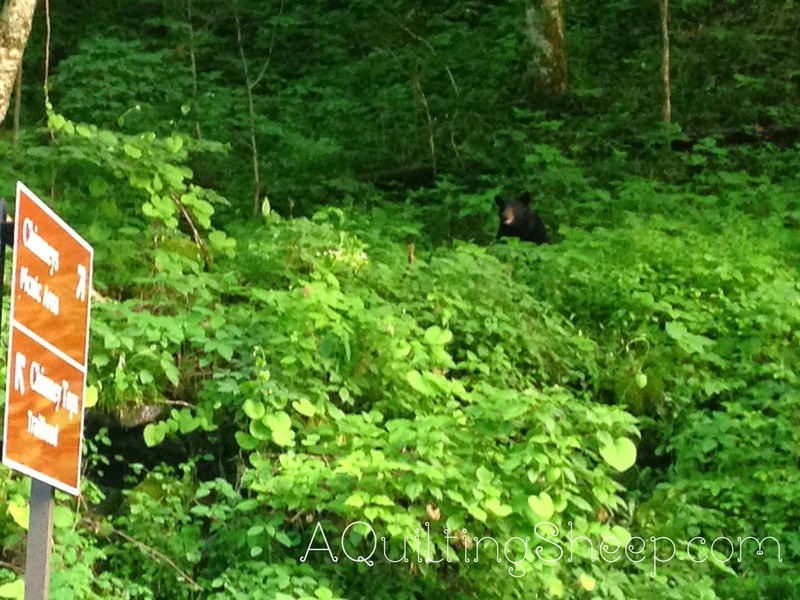 AND, I lived in East Tennessee for 5 years and never saw a bear. Yay for you! I have never been to the Smokies but the pictures you shared are beautiful. Maybe one day. I love those fabrics. Too stinkin cute and colorful.